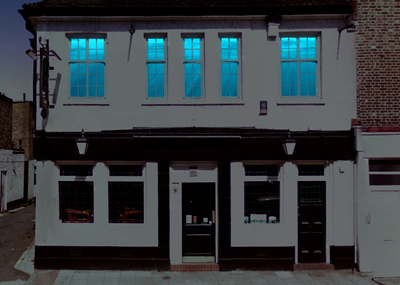 On Monday 31st October, the Royal Oak presents a night of projections by artist Kris Emmerson. Primarily working in animation, he manipulates systems more normally associated with the glossy screen images of TV advertising, computer games or the movie industry. Transferred into public space and realised on a large scale, his projections take on a sculptural quality and place the viewer within the field of action itself. before I fell asleep is a show inspired by a phrase from Breton's Surrealist Manifesto. Emmerson explains that he likes 'the sense of the moment between the real and the dream, that point where we catch ourselves in another state of consciousness, or rather between two states'. A dreamlike state is evoked by Surface, a work which can only be viewed from outside the building, transforming the upper story of the pub into an ocean glimpsed through the windows onto Clapham High Street. Emmerson takes us by surprise, injecting dreamlike images into our everyday urban environments. As a child Emmerson was first captivated by the possibilities of animation techniques whilst watching the stop-motion sequences of the legendary animator Ray Harryhausen. Movies of the 1960s such as Jason and the Argonauts and The Valley of Gwanji brought to life the creatures of mythology and prehistory. Paradoxically, it is the very latest technology that has been used to recreate the prehistoric and extinct, and as techniques have become more sophisticated these creatures have become ever more convincing and terrifying. Emmerson, however, has chosen to stretch the technology beyond its limits, to allow the cracks to show, bringing a somewhat benign and amiable demeanour to his creations such as the dinosaur dyathinkeesaurus, his footsteps shaking the ground as he plods along (see vimeo.com/19988816). Just keep swimming hints at the ultimate futility of the efforts of the megalodon, a formidable but extinct ancestor of the modern shark. Kris Emmerson studied Fine Art: Sculpture at The Royal College of Art, London He has shown in numerous exhibitions including Instance of Emergence, Rivington Street, London; Horizon Hypnotique at French Riviera, London (2011) To Be Destroyed, FA HQ, Soho Square, London; at The Boathouse Sculpture Park, Port Eliot Literary Festival, St. Germans; Can You Hear It? at The Nunnery, London (all 2010) and at Oonagh Young Gallery, Dublin and Ierimonti Gallery, Milan (2008).